New York: Watson-Guptill Publications. Very Good in Very Good dust jacket. 1976. First Edition. Hardcover. 082303044x . HC/DJ - near fine/VG. Hardcover is in excellent condition - pages are clean and intact, only markings are previous owner's name in pen on first endpage and a small red ink dot bottom edge of pages, light age tanning to page edges. Minor corner bumping. B/w illustrations. Dustjacket has light edgewear, a few tiny edge tears, moderate scuffing and age tanning to edges. A comprehensive guide to one of the most challenging embroidery techniques used for ecclesiastical embroidery and vestments. It covers tools, materials, techniques and places where metal thread embroidery can be seen. (785-4-14) ; Large 8vo 9" - 10" tall; 216 pages . Cassell. Very Good in Very Good dust jacket. 1997. Hardcover. 0304341452 . Ex-library book, but still in very good condition - laminated cover and usual ex-lib type of markings. Pages are clean and intact, light soiling upper edge of pages. Jacket has some scuffing, a little edge crinkling and a couple areas where laminate is slightly loose at edges. 1997 reprint. 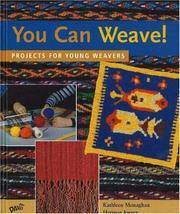 ; Large 8vo 9" - 10" tall; 253 pages; "Stillwell includes more than 2,000 entries in a comprehensive guide that explains the phraseology and details the technical aspects of this ancient craft. An abundance of black-and-white line drawings are featured to illustrate those stitches, designs, implements, and materials traditionally associated with lace making. Where confusion exists regarding contemporary terminology versus older usage, Stillwell clarifies and provides cross-references. 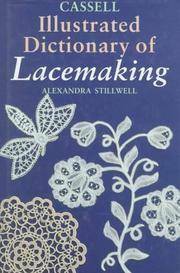 Her dictionary should be as valuable to the beginning student of lace making as it will be to one who is already immersed in any aspect of this fine handwork. " (655, 0211) . Sterling Pub Co Inc. Very Good. 1997. First Edition. Softcover. 0806913258 . Ex-library book, but still in very good condition - usual ex-lib type of markings. Pages are clean and intact. Cover has light scuffing and light wear to edges/corners. Illustrated in colour. 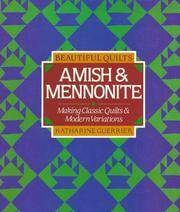 Make 27 beautiful quilts from the Amish and Mennonite tradition - suitable for quilters at all skill levels. (520, 0211) ; Large 8vo 9" - 10" tall; 128 pages . Krause Publications. Very Good+. 2001. First Edition. Softcover. 0873492587 . Ex-library book, but still in excellent - sturdy laminated cover and usual ex-lib type of markings. Pages are clean and intact, profusely illustrated in colour. 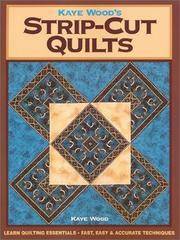 Learn quilting essentials. Fast, easy and accurate techniques. 30 different quilt projects. ; 4to 11" - 13" tall; 96 pages; Kaye Wood, host of "Kaye's Quilting Friends" and "Strip Quilting" on television, explores the many uses for her Starmaker 8 Master Template. The book features timesaving techniques, helpful diagrams for trouble-free cutting, and 23 projects for quilters of all skill levels. (395osl, 0211) . Toronto: Boardwalk Books. Very Good. 1997. First Edition. Softcover. 1895681154 . Former library book in very good condition - sturdy laminated cover and usual ex-lib type markings. Book is clean and tight, unmarked other than a few small, light stains (tea or coffee? ) affecting bottom area of one outside edge and a couple of corners within the book (quite minor). B/w illustrations. ; 4to 11" - 13" tall; 136 pages; Dolls in Canada is two books in one. 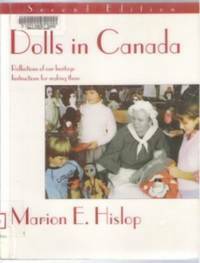 The first section is a personal and engaging look at dolls which make up our heritage; pioneer dolls, native people's dolls, dolls from various cultural groups in Canada, dolls from legends and stories, dolls in different styles and materials, and dolls by Canadian artists. Part two contains easy-to-follow instructions on how to make over fifteen different types of dolls, from rag dolls to jumping jacks, from hanky panky dolls to clothespeg dolls. (433-osl) .